Why don’t all CPUs run at ultra low voltage? Simply put, running on-die components at low voltages increases the risk of an error or failure. It takes premium batches of CPUs to reduce the error rate so only the best silicon can be used as a ULV CPU; Which is why it’s expensive! I’ll talk about ‘Turbo Boost’ and GPU later on but lets give you a few data points that show how much more efficient a ULV CPU is. I haven’t run these figures by any CPU power experts so there’s room for more discussion here but I think we’ve got a good indicator. If not, you’ll see some discussion going on below! The figures show a normalized power usage figure for two CPUs. One is a LV CPU running at full rate, the other two are ULV CPUs running overclocked by Turbo Boost at two different rates. In this test the Sandy Bridge LV CPU cores used approx. 30% more power as the Sandy Bridge ULV CPU cores. Here’s how I did the test. 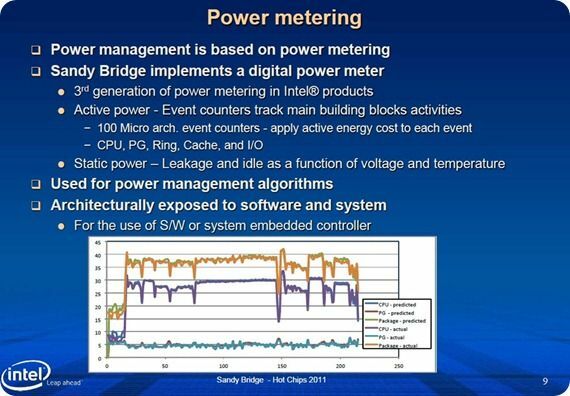 Intel were nice enough to build in some power measurement sensors into the Sandy Bridge architecture and one of them reports on CPU core power utilization. This is obviously used for the thermal logic that controls Turbo Boost but Intel made the sensors available to all so we’ve got a great way to compare here without worrying about system builds. I used these measurements to look at the power used by the Cores. 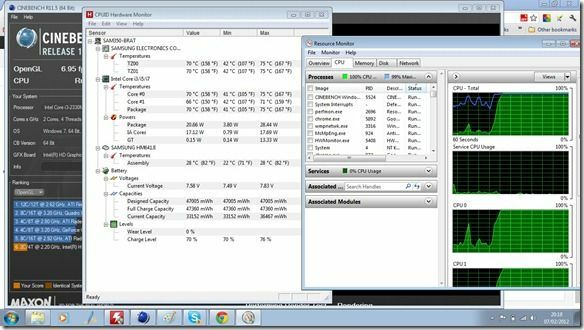 The test program that drove the CPUs was Cinebench 11.5 and the monitoring tool was CPUID Hardware Monitor. 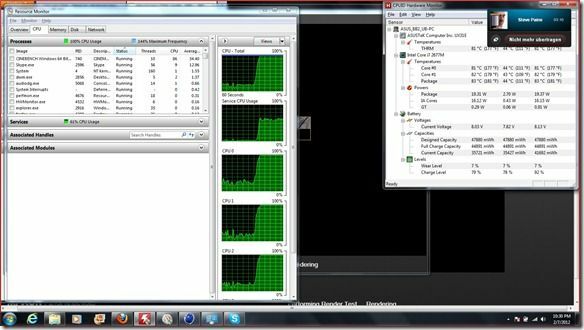 Take a look at this image from a Core i3 2.2Ghz Sandy Bridge platform running at 100% CPU. Core i7 2677M uses 0.62W / 100Mhz at this clockrate. Core i7 2677M uses 0.56W / 100Mhz at this clockrate. A quick word about system power and Turbo Boost at this stage is probably worthwhile. Average system (not including mains adaptor) power utilization for an Ultrabook running office applications is about 10-12W, less on a clean system. In this scenario, the CPU accounts for around 10-15% of the total power used by the system. You’ve got chipset, GPU, screen backlight, Wi-Fi and many other components to think about as part of the total system power equationwhich means, at these CPU load levels, the difference between low voltage and Ultra Low Voltage CPU is insignificant. It’s only when you start to use the CPU a little more that the differences become noticeable but that doesn’t affect many users. That is reflected in the results seen in part 1. The main advantage of a ULV CPU over a LV CPU are the reduced requirement for cooling and thus, thinner devices, or, devices that run cooler and are able to dynamically overclock for longer. Which brings us on to Turbo Boost. Turbo Boost is a complex set of measurements and logic that allow a CPU core, or cores, to be overclocked if part of the silicon platform (including GPU) are not being used. 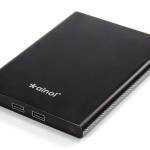 Effectively it allows a power limit to be shared across GPU and CPU. If the GPU is not being used, the ‘thermal budget’ can be used to overclock the CPU. Thermal budget is also built up when CPU and GPU are idle allowing them to burst for short times until the cores and die heat up. It’s actually more complex than that but I hope you get the idea. 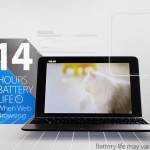 Turbo Boost on ultrabooks using ULV processors is a very valuable tool. It’s why I sent out a note of caution about the AMD Figures the other day. it all hangs on the thermal design and thermal control. The Sandy Bridge ULV CPU cores used 21% – 28% less power than the LV equivalent. 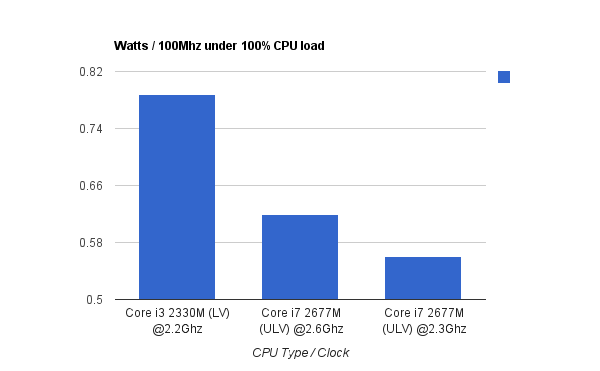 At a clockrate of 2.2Ghz, the Sandy Bridge LV CPU cores are using 3.4W more power. ULV Sandy Bridge is likely to be showing more efficiency at lower clockrates as voltages used lower. The figures might look a little boring and at normal usage levels, may seem insignificant but at higher loads it translates to significant battery life savings. More importantly, the difference in maximum load figures determines how thin and light a laptop design can be. As we look forward to Haswell’s better overall efficiency, TDP figures of 13W and improved Turbo Boost, one can imagine how much that’s going to help designs. We could be looking at fan-off designs for the most part too. Question from a reader: Why don’t high clockrate ultra-low-voltage CPUs exist? I’m assuming that higher clock-rates increase the risk of error and that we’re simply looking at a technology limit. Note that some Ivy Bridge ULV CPUs will Turbo Boost to 3.2Ghz and Haswell will improve things even further in 2013. Lets talk about this in the comments below and if you know any silicon power experts, invite them to have a look and comment. Thanks to Cosimo Kroll, Ultrabooknews.de for the help in doing these tests. C2D’s didn’t have Intels terrible excuse for a graphics solution built in. 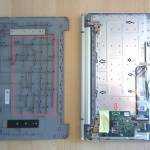 The 17 watts includes both the CPU and the GPU. I would say that the current generation Core i’s are about as efficient as the C2D’s. The first generation Core i’s had terrible efficiency though. Well, not everyone wants a graphic solution built in. Quite a large number of people merely use their notebooks for office work and just surfing, which a SU7300 or a SU4100 would be more than enough. This is where Intel lacks market research and what the market wants. The market yearns for a notebook with a low TDP and a “whole day” charge. And the lower the TDP, the longer your notebook will last. Intel should have created two lines of CPUs, one without graphics built in and another with graphics built in. After all the SU7300 was already built, its just a matter of improving on it. You still need a GPU to do basic office work, just not a fast one. There has to be at least something pushing pixels to the screen. Back then Intels IGP was one extraordinary failure not even worth using the words “graphics” to describe. With Sandy Bridge they have a semi-capable GPU and integrated northbridge on-die. Same can’t be said for the SU7300, and they’ve also increase the CPU performance by a large margin. Also 10/17W is nothing more then a number which doesn’t represent power consumption one bit. It’s there for manufacturers to design the cooling needed for said chip. This is not true. For applications that load the CPU enough, lower TDP parts will use less power than higher TDP parts. The reason you don’t see that in lot of cases are because lot of applications do not use full TDP. Nowadays the power management is advanced enough that you will see very little or no difference in power usage(thus, battery life) when the application does not use up all the TDP. Manufacturers still need to design to TDP because its a worst case scenario, and it would be stupid to design it at lower levels. Of course lower TDP parts will use less power, but the logics some people are using that TDP = Power Consumption is wrong. BTW, Core i3 2330M isn’t a LV CPU but a 35W Standard Voltage chip. Looks low-voltage to me on cpu-z or do we have different definitions? Are you referring to the ‘s’ range as LV? Maybe it should just be called ‘mobile’? Back in C2D days, 25 watt chips were common (eg P8600). I’m pretty sure those were used to be referred to as LV as opposed to the SV chips (eg T9400). 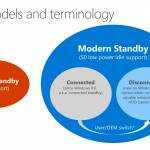 I think Standard Voltage Mobile would be a better terminology, but I don’t see why LV is wrong since I don’t see 25 watt LV chips anymore. I have an additional theory to test. The Core i3 requires the full voltage to run at 2200MHz since its a low end bin, but a Standard Voltage Core i7 might require less voltage to run at only 2200MHz since at the voltage it takes for the i3 to run at 2200MHz, it can run at 2800MHz, so it might be more equivalent to the ULV i7 at 2200MHz. I request a test with a Core i7 2640M underclocked to 2200MHz. Unfortunaltey I can’t do that test. It’s almost irrelevant though as the TDP would be too high for a thin laptop. (apart from perhaps some very high end designs.) What would be more interesting is to manually undervolt a LV/mobile. You might get lucky! That’s beyond anything I have the time for though. WRT terminology I guess it’s safer to move away from the ‘LV’ and ‘ULV’ terminology. I have a feeling that Turbo Boost / Speed Stepping controls a range of voltages that overlap in some cases. I will refrain from using the LV / ULV terminology in the future. Actually the voltage designation is still true. The reason you aren’t aware of the LV 25W parts are because its barely(or not at all) used. The regular SV 35W parts have 0 for the 4th digit while LV and ULV have 9 and 7 respectively. The lower TDP parts require less power to sustain same frequency as the higher TDP parts, as expected. You might see voltage, or frequency, overlap, but the lower TDP parts will always clock higher at same voltage, or use less power at same frequency. So if I plan on having fairly high CPU loading then I should get the UM parts for longer battery life without sacrificing speed? 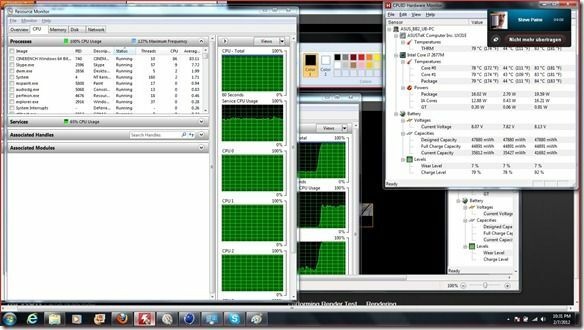 Otherwise, I should just get the cheaper M part if my usage is fairly low on CPU resources? So using two NP350’s on Amazon as an example, what would be the realistic difference in battery life to expect between the i5 & the i3-ULV? Thank you for performing more testing in response to reader comments,however as you state in you introduction, we readers were interested in the efficiency of a LV (or are they SV?) components running slower than their nominal rates matching the nominal clock rate of a ULV component.. This doesn’t test that: this comparison has both processors running at or above their nominal clock rates. While I am interested to learn that a nominally slower ULV component that iwhen Turbo Boosted to run faster than a LV component is more efficient, it is not the answer to the question we seek. I’m sure some people might be interested in power efficiency at the high end, but there are problems with the test in that regard. 1/. There is no information on how long the processor can remain in Turbo Boost mode before lowering its clock rate. 2/. This test is slightly cooked by choice of the components. It pits Intel’s second more inefficient LV mobile i3 with their most efficient ULV i7. The same test between a i3-2370M and say a i5-2557M would be closer matched. But as you say, at low clock rates the power requirements of the CPU fade into the background. So perhaps paradoxically, those of us willing to trade performance for battery life, can go with with a faster LV processor and simply restrict the maximum clock speed when operating on battery, while those who have more CPU intensive tasks and want to (try to) maximise both performance (perhaps responsiveness is more apt) and battery life need efficient parts – they should go with a nominally slow processor that is more efficient at operating at higher speeds for brief periods, i.e. a ULV part with Turbo Boost. Since Turbo Boost will not operate continually, this prescription will work best for those who only need brief periods of performance. It does seem to fit many interactive task possibly even web browsing and word processing – tasks that we happily run on low power CPUs. I would guess only the shorted video rendering tasks would benefit significantly from Turbo Boost. Maybe that is the case for ULV. I’m not sure what the case was before Turbo Boost and I first started wondering about this question in the days of the Core 2 Duo which didn’t offer that! I can perform the same test with the 2.2Ghz locked to 1600mhz and get the ULV part tested with max 1600Mhz. Leave it with me. Is comparing frequency/voltage tables for 2 Sandy Bridge parts sufficient to judge which one is more efficient? What other data needs to be taken into consideration? I think we need to be careful not to get too hung up on CPU core differences when the differential, in average usage scenarios and wrt the more important system power usage, is tiny. I have seen this discussed before, but would you be able to create a test that tests actual battery consumption for completing a task. The question is, does the LV CPU take more power (energy/second) than the ULV CPU but get things done fast enough so that it down clocks to idle once the task is complete and ends up using less energy to complete the task. I gave a theoretical answer to a similar question to a question in Part 1In summary, the more stuff you have off, and the larger the contribution to energy usage the CPU makes, the more important CPU efficiency becomes. In the article above the ULV i7 CPU is not only more efficient than the SV i3, it is also faster – at least for short periods of time. Intel used to call this principle ‘HUGI’ – hurry up get idle. It doesn’t apply in many pc usage scenarios though. Probably more effective on phones where screen and networking have a bigger impact on battery life. « Toshiba Satellite U840/U845 Ultrabook is Official. 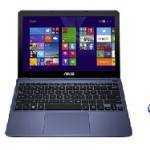 Specifications, Images, Price.